1. The push up is not only a foundational upper body strength exercise, it is also a dynamic core stability exercise. 2. If you cannot perform full-length push ups, there are better alternatives than the kneeling push up that are safer and have a much higher return. 3. Appropriate exercise selection + consistently excellent technique + smart work is key to progressing safely. 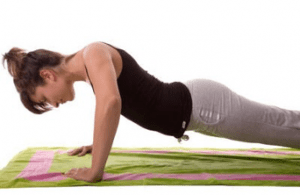 The push up is one of the most universally recognised bodyweight exercises around, which when performed correctly demonstrates not only fundamental upper body strength and stability, but also one’s ability to generate whole body tension and core stability. That’s right, push-ups are essentially a core exercise too. The function of the outer core muscles is to resist movement of the spine. That is to absorb and transfer force. It provides a robust platform from which movement of the extremities, such as pulling, pushing, carrying, throwing, striking, jumping and catching, and running can occur. In the push up, the function of the core, particularly the anterior wall known as the rectus abdominis is to provide an anchor for expressing pushing force, and to resist movement of the spine into extension. Unfortunately push ups are rarely performed correctly. This can often be the result of improper instruction and technique, inadequate upper body pushing strength and control, but more commonly the main culprit is a lack of sufficient core strength. One of the more traditional approaches to addressing the inability to execute a push up is to regress to a kneeling position, as you can see in pictures 1 and 3. This makes the exercise easier as this set-up cuts the body in half, shortens the lever and reduces the load. Unfortunately there are a few problems with this version of the staple exercise. Firstly, the kneeling position with knees slightly bent tensions the tissues at the front of the thigh that cross both the hip and knee joints, namely the rectus femoris muscle. Much like a pulley system, in the bent knee set-up this increased stretch can pull at the attachment site of the pelvis and effectively pull it into an anterior tilt. This forward rotated pelvis reduces bracing and tension capabilities of the anterior core musculature and glutes. Since quality push up repetitions require the ability to generate a strong bracing strategy with your abs and glutes to maintain the position of your pelvis and spine, performing the push up from a kneeling position is not ideal. Further, the sagging low back position at set up can cause compressive stress to the lumbar region of the spine as it is driven into excessive extension, which is exacerbated with the increase of pushing force through the arms. The shoulder could also be at risk due to the forward weight shift that can occur and subsequent increased support load if there is also poor scapulohumeral rhythm and stability to handle it. This could lead to some of the more delicate structures in the shoulder having to take up much more of the slack. When you have all of these other areas of passive restraints take up the workload of mitigating forces, at best you fail to actually target the intended movement, make little progress if any and may simply have to recover more. At worst you might get hurt. The push up is one way to challenge and develop the skill of whole body bracing and torso control, which helps to distribute load across more area, and performing them from a long lever position is how we do it. As mentioned earlier, the key to training that improves movement quality and quality of life is appropriate exercise selection + consistently excellent technique + smart work.